It was from the plot of a horror movie: the haunted house sitting abandoned on the hill, the strange labyrinthine history of the family who owned it and the influence, even in their absence, that they still cast upon the town, the outlandish rumors circulating around them that were repeated by more than a few of the town’s long-term residents, and to a lesser and more personal extent, my desire, ever since having moved to the town, to somehow make my way inside of the house. Astoria, Oregon. This was the oldest town west of the Rockies, at least in terms of having the first post office. The rainiest urban locale in North America, with Washington’s secluded Hoh Rainforest being the only place on the continent that receives more annual precipitation. Though over the six years I lived in Astoria, having moved there on a whim after a bicycle trip down the Pacific Coast, the city struck me as a place that was prone to tragedy. Surrounded by water on three sides, it lies next to the the point where the Columbia River meets the Pacific Ocean – the river’s mouth known as the Graveyard of the Pacific due to the area containing more shipwrecks than any other place in the Pacific Ocean. A portion of the town itself sits below sea level, relying on the force of the Columbia to hold back the ocean. Still, the tides rise and fall daily, exposing mud flats and the occasional whale carcass at the ebb tide. The town’s steep hillsides are prone to shifts both abrupt and gradual, sometimes taking entire sections of road out with them, but more often just causing the foundations of homes built atop them to shift. Originally built as multiple villages upon multiple grids, it is possible to see where the mismatched grids align today in the wavy confluences of streets that are anything but seamless. And fill was laid down combining downtown with Uppertown, later to have a toxic logging mill constructed, eventually followed by boutique-looking “pond-front” homes on top of this polluted land. Astoria – built from the wood and logging-riches that made it a destination – burnt down multiple times, until architects realized the wooden-pier construction that expanded downtown also acted as an oxygen bellows if a wayward spark or off duty worker’s cigarette ignited the logging mills’ dust, and now a series of concrete walled underground tunnels lie where those wooden pier pilings once stood. 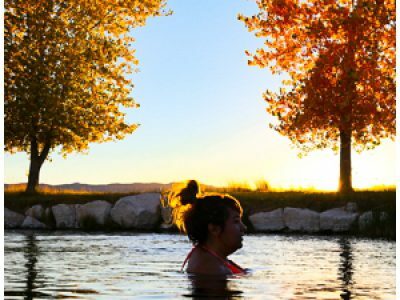 The area markets itself as a tourist destination, being the point where the Lewis and Clark Expedition reached its westernmost point. 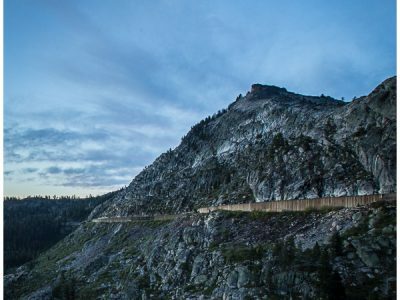 Though no one has been able to pinpoint where the explorers built their Winter camp, a re-creation of the camp and forts were constructed in the area where it was thought to be. Several years ago, that fort caught fire and burnt down too. And whereas Portland, lying 100 river miles inland, was once known for shanghaiing drunks, its crimps waiting until bartenders had fed these men enough liquor for them to tease out an inebriated signature on a contract before loading the unassuming lush onto a ship bound for a foreign port, Astoria was known for not even bothering with such trivialities, and instead just loading anyone unfortunate enough to visit with a bartender or working girl in on the hustle onto a ship bound for a foreign continent. At least one building in Astoria’s Uppertown neighborhood still has the trap door in its floor that once led to the catwalks to the docked ships. 1). From 1991 until 2014, a man named Willis Van Dusen, who some think of as a local good ‘ol boy, held the office of mayor (his side business was owning a Pepsi-products soft drink distribution warehouse in town, and locals tell stories about how he would loudly storm out of a restaurant if he ordered a Pepsi and was told that they carried Coke products instead.). 2.) Due to the deadly history of the Graveyard of the Pacific, trans-oceanic ships headed for inland ports can only enter or leave the Columbia with assistance from a bar pilot, a highly-expert captain who enters the ship in either the ocean or at the river bar and guides it over the historically deadly tides and hidden meandering shoals. 3). Finally, around the late 1990’s, Astoria had a population of about 6000, though this number swelled a bit during the Summers. 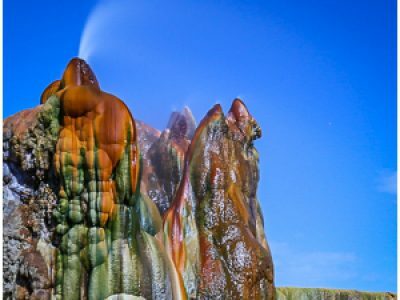 But spread out and separated by geographical barriers like rivers and hills, the population of the core area of town was less than those numbers. The city was served by a lone high school, a single post office and the few traffic lights in the downtown strip about four blocks long would switch to blinking red or yellow after night fell. Basically, it’s a town where everyone knows, or knows of, everyone, and word of mouth is still the primary viaduct for the spread of events, news and local issues. Upon moving to Astoria, I would occasionally hear stories behind the Boo Radley-esque abandoned home on the corner of 15th Street and Franklin Avenue. 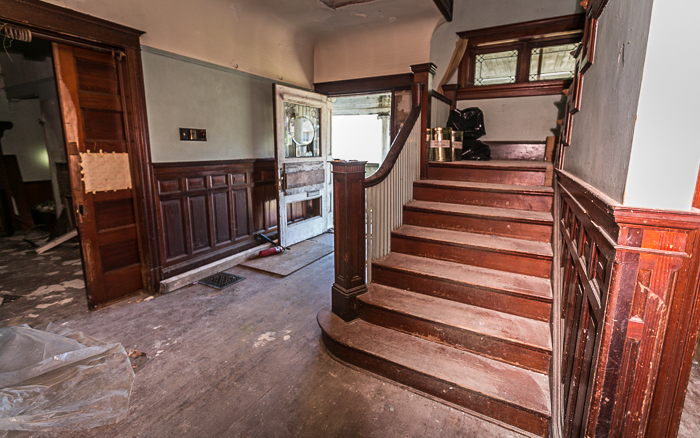 This home was large, imposing, and beautiful in its decay – one that would only increase over the ensuing years. I would sometimes walk carefully through the overgrown blackberry bramble that had taken over the yard of the lot that it sat on, leaving only a narrow path up its old concrete walkway and around the perimeter of the home. The home, I learned, belonged to Harry and Mary Louise Flavel, brother and sister, both of whom had fled the city in the aftermath of Harry being put on trial for stabbing a man in town one night. The Flavels occupied a prominent place in Astoria’s history, a historic family in a historic town and maybe the most visible example of the city’s Old Money. I asked friends about the house, and frequently enough, stories of the home and the Flavel family would arise without needing to be incited, such is the flow of conversation in the smallish town. What was often amusing, and perplexing, was attempting to figure out the validity of these stories. Many seemed so outlandish that they had to be rumors, or at the very least, significantly embellished over time. Over my years in Astoria, I would spend afternoons in the files of the historical society looking through old news articles. I would often check out historical newsletters and publications from the library. I would try to remember every rumor and story about the family told over the bars and at dinner parties in the quiet town. It’s interesting trying to piece together fact from fiction in a small town timeline before the internet came to ubiquity. The town’s single newspaper is the primary record, though the paper’s editor, like so many other individuals in town, reflect a strong sense of bias when speaking of the family and past events. Especially so in a historical town whose economy is based in large part on tourism, and the oversized myths might just be encouraged to some subconscious degree. As may be imagined in a small community, it’s hard to find people with first-hand knowledge who will speak openly. There seems to be a large degree of suspicion, even fear of talking about the Flavel family, or many of the branches leading to others in the community. This shrouds much of the actual events in mystery, and leaves the rumors to fill in the blank spaces. These rumors were more than fed by the eccentricity of the family at the heart of the story as well. Over time, I thought the rumors created a pretty entertaining story in themselves. And if it may be impossible to know the truth, for the time being, then the story and sequence of events as they are popularly stitched together in town still makes for a stranger-than-fiction, and uniquely Astoria, narrative. I can’t attest to the accuracy or truth of all, or even much for that matter, of the information that follows. Again, the scene, the environment, the cast of characters could all easily be straight out of a movie script. But they’re real. I no longer live in Astoria, but this entire story – the oddity, the small town politics, the constant wrinkles and seemingly inability for the sequence to maintain any type of linear path – is amongst the things that drew me to the town. 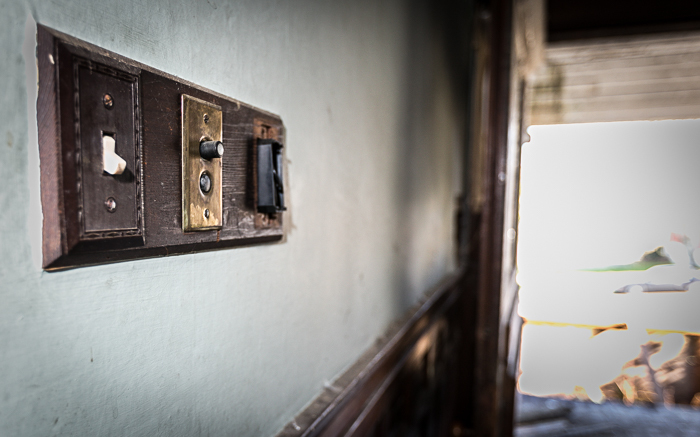 These are a few of the ghosts of the George Conrad Flavel House. Not much is known about Captain George Flavel before he came to Astoria. While one friend of his asserted that he was born in Northern Ireland in 1823, census takers recorded his birthplace as New Jersey, while different sources also claim Oregon, and Norfolk, Virginia. Flavel is most remembered for starting the first bar pilot business on the Columbia River, charging ship traffic a fee to provide them with safe passage over the deadly and moody river bar. Others attempted to challenge Flavel’s hold on the bar pilot business, however Flavel would anchor a ship of bar pilots in the sea allowing for immediate boarding for incoming ships, saving a day or more in time versus other pilot companies who would wait for favorable conditions to leave the Astoria ports and head to meet the ships at sea. Flavel would even send pilots to board ships in San Francisco in order to have the jump on competing companies. Eventually ship captains became loyal to Flavel. Flavel became a millionaire, and at age 31, married the 14 year old daughter of Conrad Boelling, one of the town of Astoria’s pioneers and owner of the Astoria Hotel. George and Mary would build an elaborate home at 8th and Duane Streets, which would eventually be turned into the Flavel House Museum, that remains open for tours to this day in Astoria. The two had three children, one of whom was a son born in 1855 named George Conrad Flavel. George Conrad Flavel and his wife, Wenona, would never come to reside in his parents’ mansion, but instead would build a house at 15th and Franklin in 1901. George Conrad Flavel would work as a bar pilot for his father, who had proceeded to purchase commercial properties in the town. George Conrad and Wenona would have one child, a son named Harry Melville Flavel. Harry Melville Flavel is remembered as being less dynamic of a civic personality than his father and grandfather. He acted as president of the Flavel’s Bank and oversaw it being bought out and taken over by a larger bank. He had three children with his first wife – the middle child, Patricia Jean Flavel was the one who donated Captain George Flavel’s mansion to the Clatsop County Historical Society. Harry Melville Flavel then married his second wife, Florence Sherman. After the death of his father in 1923, Harry Melville Flavel inherited the home on 15th and Franklin, and moved with Florence back into the house to live with his mother, who remained there until her death in 1944. A year after returning to the house, Harry Melville and Florence Flavel had their first child together, a daughter named Mary Lousie (born 1925). Two years later, they would have a son named Harry Sherman Flavel (born 1927). Following the older Harry’s death, Florence lived with the children, Harry and Mary Louise, in the home at 15th and Franklin. Such was the situation up until 1990. Rumors persist of the youngest Flavels, Harry and Mary Louise, and their contempt for the city of Astoria. 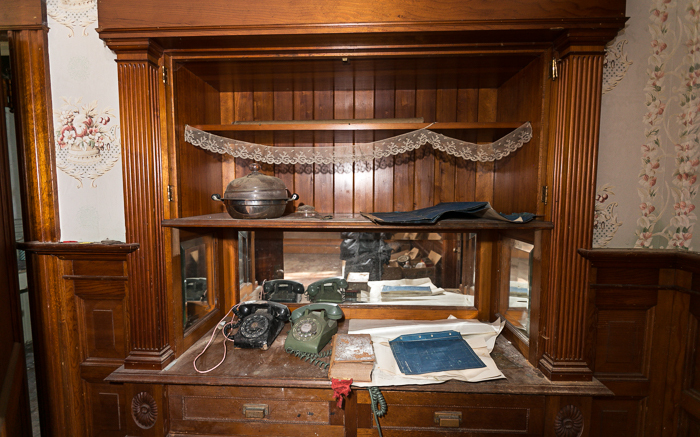 One reason theorized is because the Flavels felt that they should be the rightful owners of the Flavel Mansion, which the city had since operated as a museum. 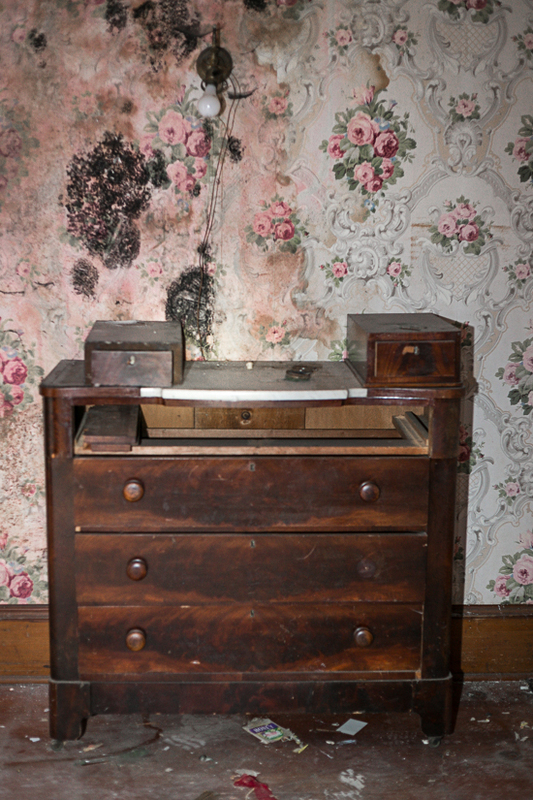 A story circulating in town goes further and says that following the abandonment of the 15th & Franklin home, the Flavels became aware of some of their furniture having been stolen, later to end up inside the museum. When a representative demanded to know where the museum obtained the furniture from, it was traced back to an antique shop in Portland, whose records indicated that the furniture was sold to them by the mayor of Astoria’s son. Though there doesn’t seem to be any record to back up this story. Regardless, this contempt is described as the reason that a block of commercial buildings owned by the Flavels were abandoned and allowed to fall into disrepair, lying empty and derelict for years on both sides of Commercial Street between 9th and 10th Streets in downtown Astoria. The rumor is that a vindictive Flavel family decided they would make the primary route into Astoria from the coastal 101 highway as unattractive as possible for the city. Mary Louise was known as being the more social of the Flavel children. She would attend social events in Astoria, and would eventually leave for New York City where she would manage performers in the opera world. She returned, however, in the 1970’s, and the two children would continue to live in the house with their aging mother. Another story going around concerned the moody Harry locking his mother and sister out on the upstairs balcony one night when he became upset, neighbors around the house hearing her screams until the police were forced to rescue them with a ladder. There is nothing on record confirming this either, though the visceral imagery of a woman held captive on the cold and rainy upstairs porch is an oft-repeated story to this day. An additional rumor going around is of the notoriously cheap proclivities of the younger Flavels. It’s not known if they had the money and just refused to spend it or were genuinely tight on money, but many of their actions were characterized by this. In the 1980’s, a paint crew set to work to repaint the house. Though after two weeks of work, and having not seen a payment, they left the house with much of the paint scraped and abandoned the job. The house would remain in this unfinished state. In 1983, a 22 year old named Alec Josephson was driving home from a bar in downtown Astoria when someone slammed a dog chain across the hood of his car. Josephson confronted the person near the Star of the Sea School, and in the ensuing argument, the man said he hit Josephson’s car because he was driving too fast. In the moments that followed, the man, Harry Flavel who would now be in his late 50’s, stabbed Josephson with a knife. Flavel was arrested and charged with first-degree assault and attempted murder. With Florence aging and mostly confined to the home, Harry and Mary Louise became increasingly reclusive. Over the next few years, it’s noted that invitations to others to enter the home became increasingly sparse. 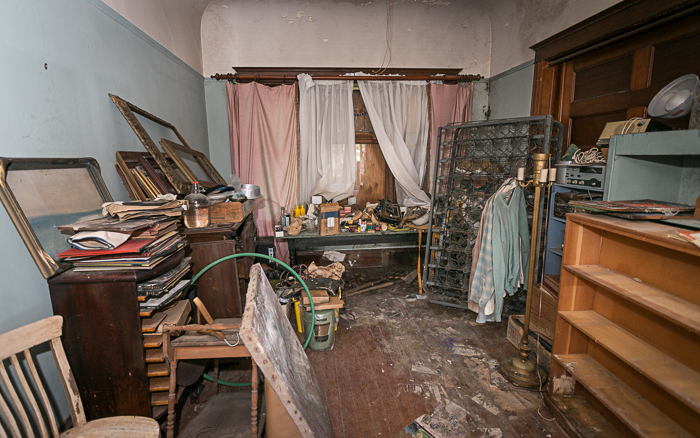 Visitors reported piles of old papers and boxes lining the house, leaving many of the rooms with only enough space for one to very narrowly walk through, while the rest of the available space was filled with what looked like a hoarder’s collection of worthless junk. Flavel was found guilty of assault, and in 1990, after his appeals – eight rounds in total – were eventually exhausted, facing a one-year sentence in jail, neighbors tell of seeing the family pack into a car and drive away. With the house locked behind them and Mary Louise requesting the previous restitution check to Josephson – a $800,000 fee awarded through a civil trial – cancelled, the Flavels left Astoria, their whereabouts unknown. A year later, Harry was arrested in Pennsylvania for stealing hotel towels, however he failed to appear for his extradition hearing. He was then arrested again in Tewksbury, Massachusetts after a hotel worker reported him to local authorities. He was sent back to Clatsop County. After serving his sentence, he would return to Massachusetts, this time not being found. Florence, meanwhile, would die at the University of Massachusetts Medical Center in Worcester, her children refusing to pick up her body. Following their mother’s death, Harry and Mary Louise would return to Oregon, but would never move back into the home on 15th and Franklin again. Legal records following their return show them as having lived in the Beaverton area. The home along with the family’s commercial properties on Commercial Street would continuously come up for forfeiture due to unpaid taxes, though each time would be saved from forfeiture in the 11th hour, and would continue to remain in legal possession of the Flavel family, represented by a family trust. Sometimes, however, the circumstances of ownership were slightly more murky. In one instance, Jim Neikes, a former logging and trucking company owner, bought one of the commercial properties near 9th and Commercial streets at auction for $80,000. Though in this instance, a judge allowed the Flavel trust to pay $108,000 in back taxes with interest and Neikes’ purchase price, and the Flavels ultimately retained control of the property. In another instance in 1996, Robert and Elizabeth Stricklin were planning to bid on the house at auction, but instead opted to pay the back taxes owed themselves, in hopes that they could then work out a deal directly with the Flavels who would legally retain the property after the taxes were paid. The Stricklins ultimately had to sue the Flavels in order to recover their payment, and the Flavels remained owners of the home. In the absence of electricity, we spent the next few days collecting ice left by the fishing boats that would come into port to unload their catches to take home and store our food with, and walking between friends’ houses and apartments, depending on who had gas ovens and water heaters. A very large portion of the community opted to leave town during the storm, and remained away over the successive days of the power blackout. Cel phone towers were toppled or powerless, and there was no signal, and local police lost use of 911 dispatching services, and had to create a local phone number in the event that landline owners needed to get ahold of them. Downtown, armed guards sat in a truck outside the Bank of America branch, whose building had lost its glass and suffered significant damage, leaving its vault exposed and vulnerable. After dark one night, we parked on the street and carried an aluminum ladder quickly up the walkway and around the back of the house. We took turns climbing through the window. The rest of the plywood boards remained in place, allowing us to use our flashlights. 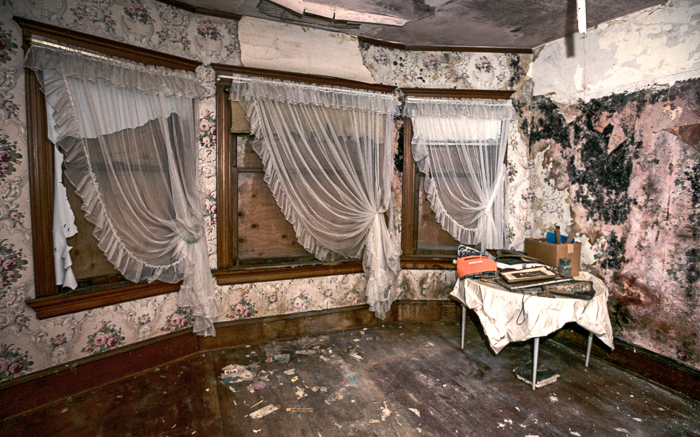 The interior of the house looked as if a bomb had exploded – throughout the entire house. I’m pretty certain I never made actual contact with the floor. 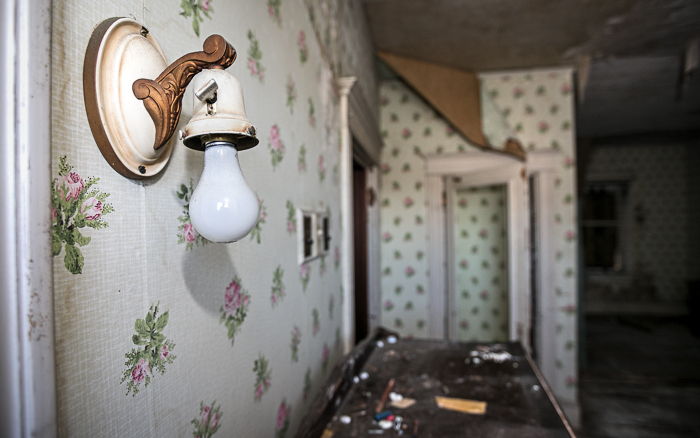 Each room was buried beneath a solid layer of papers. 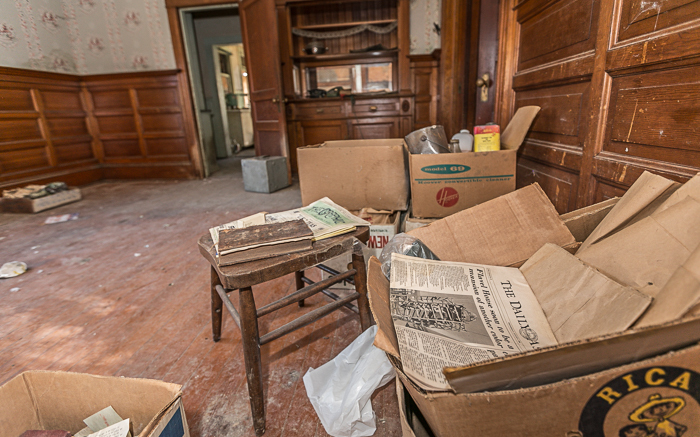 Books, telephone books, furniture, boxes, old newspapers, magazines and an array of other junk covered all of the floors, often over a foot thick. 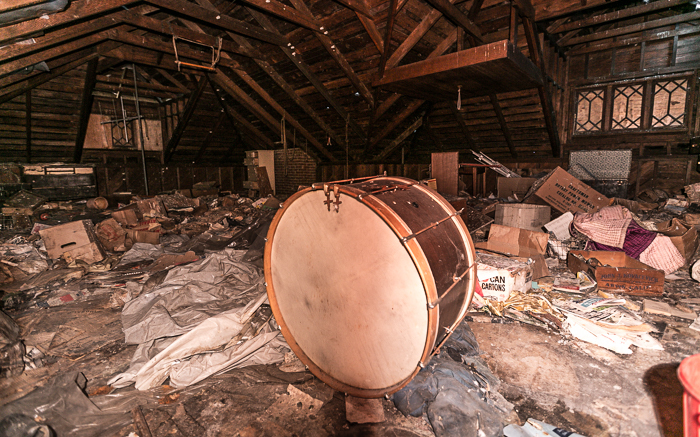 It was clear that other post-abandonment visitors had made a complete mess of the inside of the house. 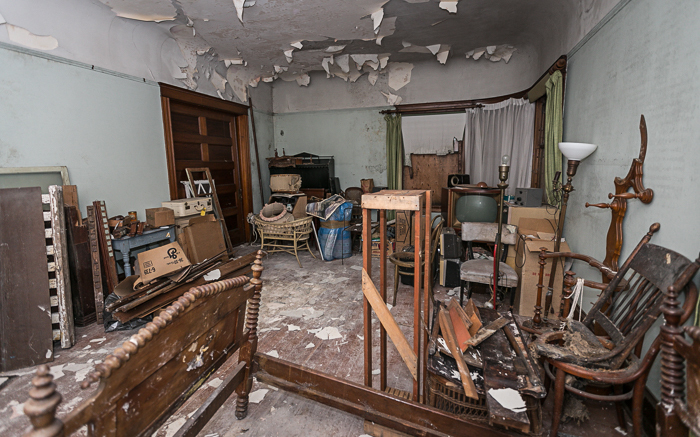 It was also notable that there was no nice furniture in the house, looking like past visitors may have stripped the interior of anything deemed potentially valuable. Even in the absence of the Flavels, in the mid-2000’s a restaurant moved into one of the commercial properties. For years the empty storefronts had cardboard signs leaning against the interior windows of a phone number to call to inquire about renting. They said they called often, and were repeatedly told by the trust that they would check with the owner, then shortly after followed up with a ‘No.’ Until one day, the response came that it would be fine. At least one individual in town communicates with the Flavels and their conservator. In late 2010, while trying to search for the a way to contact Mary Louise, it was discovered that a death certificate had been issued in Portland for Harry Flavel several months earlier. After asking the Flavel’s Astoria liasion if Harry had in fact died months earlier, it was confirmed. A news story goes on to say that after nine months, Mary Louise had still not claimed her brother’s body from the morgue, and it was buried in an indigent field in the Portland area. 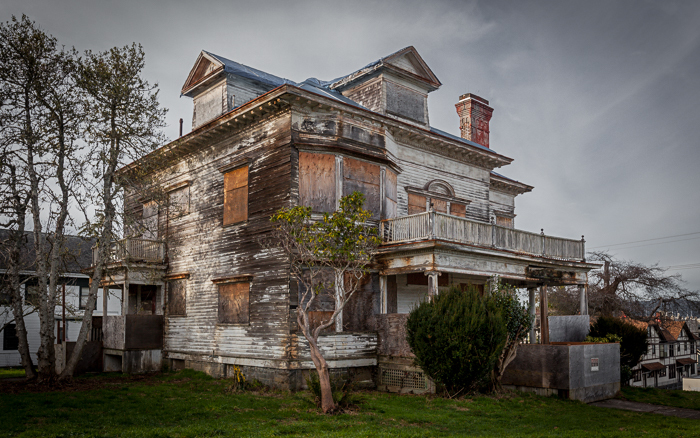 In 2011, the city of Astoria initiated proceedings to create a derelict building ordinance, primarily to deal with the Flavel properties. This ordinance allowed the city to impose a fine for each day that properties were in violation. After not being able to reach Mary Louise, now the sole owner of the properties, the city of Astoria began to put the process of forfeiture to the city into motion. If the fines, totalling $5.6 million at their highest point, went unpaid, the city would be able to take control of the home and commercial buildings. Ultimately, a deal was struck that would allow Mary Louise to sell the properties herself. The house on 15th and Franklin would be listed at auction through her conservatorship in 2015. We returned to the house. Posing as representatives for a potential buyer and paying a small fee created to discourage non-buyers from entering the property, we came to the house for the one-hour window of time that interested parties could tour and appraise the home. The plywood over the front and rear doors, along with the basement entrance had been removed, letting light into the house. 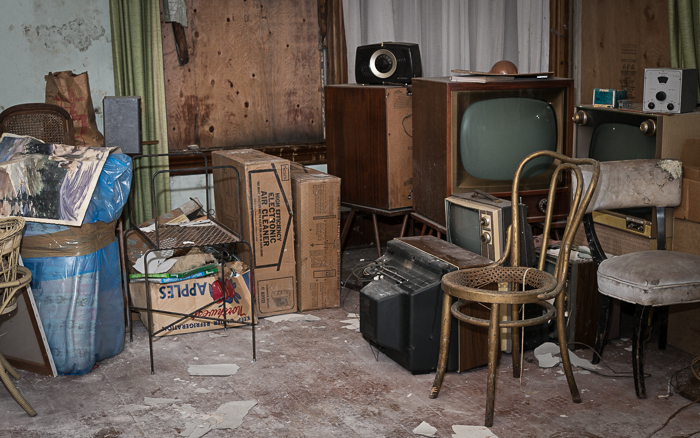 Much of the junk on the floors, along with most everything else had been hauled out. 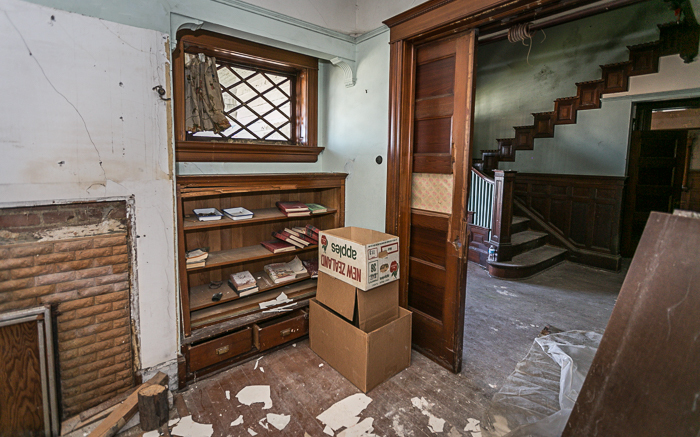 Though dusty, moldy, and with peeling wallpaper and torn fixtures, the interior features sat mixed with the few boxes, the ripped floorboards, and much of the odds and ends that had not been thrown away for whatever reason. Aside from a few personal artifacts – some clothing still hanging from wiring strung across the basement ceiling, kitchenware sitting amongst dusty shelves, not to mention the refrigerator that city officials had found a dead dog of unknown age in when inspecting the house prior to the sale – there was not much to show that this had been the family’s world for an increasingly secluded and erratic period of their lives. On the outside, the home still appeared an old sentry perched over the intersection, bookending a row of colorful homes and a Bed & Breakfast displaying notices of historical status. I took pictures, but in order to not give away that I was just here to see the house, I only had my 50mm lens and camera flash, and I walked the floor with a friend posing as my contractor consultant, admiring the rooms with only a few others there who had a genuine interest in possibly buying the building. Word of the figures that the conservator was expecting the auction to reach got around, but the numbers seemed like only someone accustomed to higher price tags more in line with Portland or Bay Area prices would consider paying – anyone local basing their bid on local market prices, coupled with the historical status that would require a significant amount of improvement but did not allow for much physical change would probably find the cost prohibitive. Eventually, a local business owner with a plan for the long term restoration of the property won the auction. 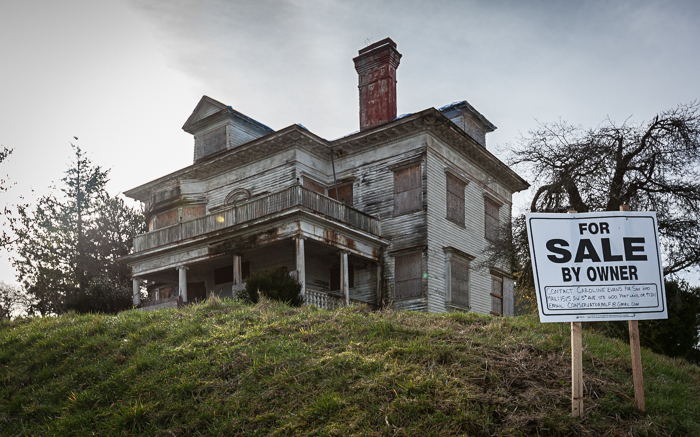 As of 2017, the last of the Flavel’s derelict properties were sold, leaving the family without any stake left in Astoria. A couple people have been able to track down Mary Louise, 92 years old in 2017, to her current residence somewhere in the Portland area, and though she is friendly, she seems to have no interest in talking about Astoria or the properties. Astoria is changing too. The Flavels exist only in name, and as new people move to the town, it follows that the occasions when the Flavels get brought up over drinks at the town’s older bars or newer breweries – outlandish stories of questionable validity of a family that has unintentionally made outlandish their ethical and behavioral compass – will only occur less and less frequently. 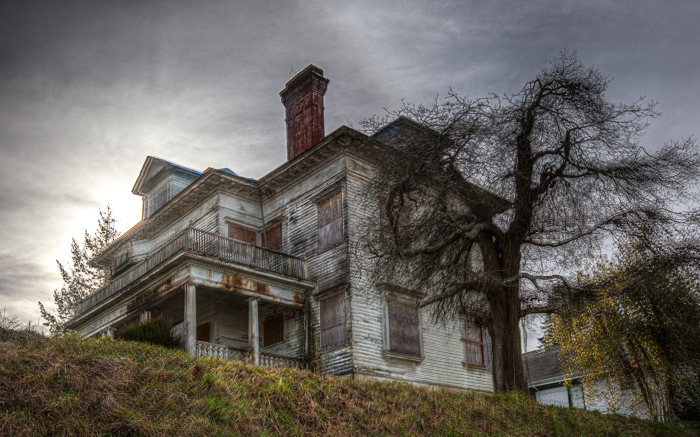 The Flavel home sits eerily atop a slope overlooking Franklin Avenue. Above the porch is the balcony that Harry was purported to lock his mother and sister out on when he became upset. Often trees and foliage in the yard were overgrown, hiding all but the upper features of the house from this angle, however, here, they were trimmed back in order to facilitate the home’s sale. Windows are boarded and paint is unfinished after the Flavel family refused to pay a crew who had begun working to paint the house in the 1980’s. Inside the front door of the Flavel home. 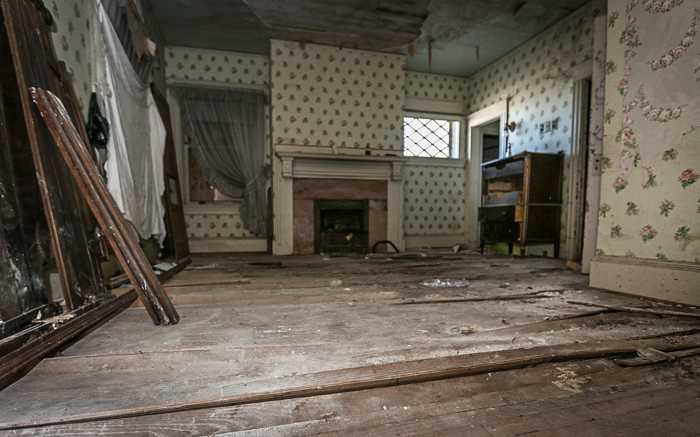 Significant work had been done to clean the piles of junk that had lined the floors and walls during the Flavel’s period living here, that were later strewn about everywhere by trespassers once they had vacated the home. A significant amount of work was needed just to get the home into condition where it could be entered and viewed by potential buyers. 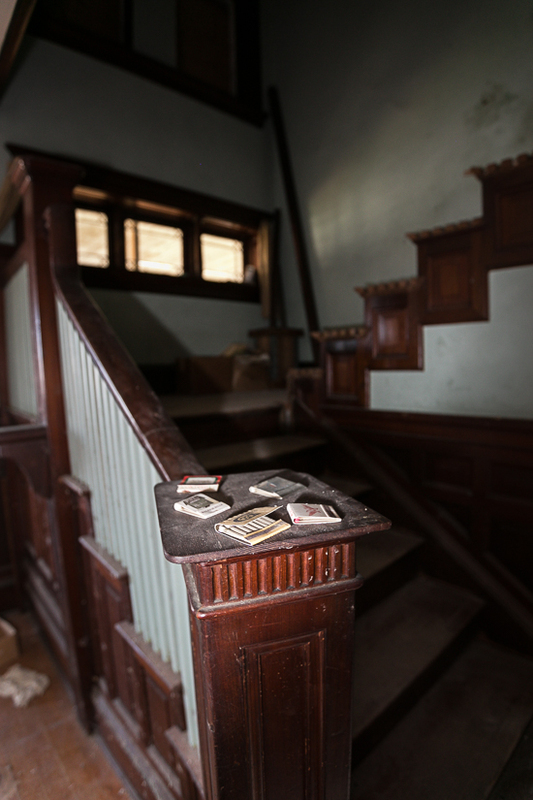 Here a few matchbooks sit atop the main stairway banister. The southeastern room on the lower floor with windows facing 14th Street boarded up. Boxes hold books, telephone books, papers and vinyl records which were piled up across the floor of this room previous to cleaning. 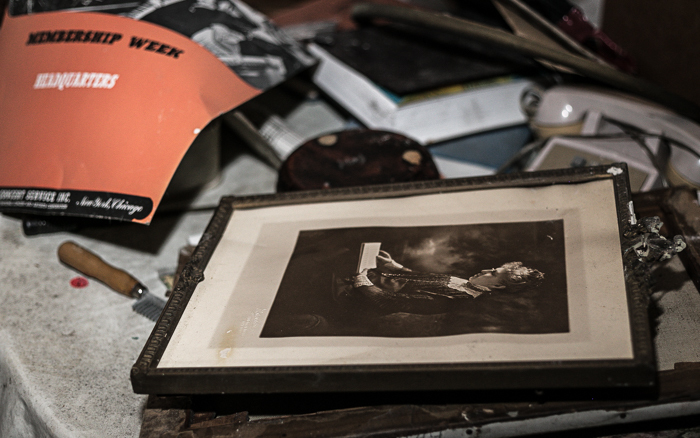 Amongst the junk and detritus left by the Flavel family were many personal items including photographs, photo albums, paintings, and cards. 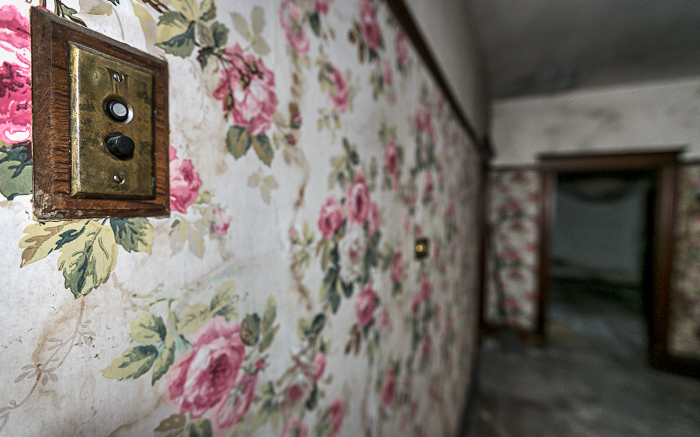 On previous visits, personal effects such as sets of clothing and bottles of medication could be found around the home. Boxes of papers stacked in the southeastern room of the lower floor. Furniture collected and gathered from throughout the house and placed in this room during open house inspections. 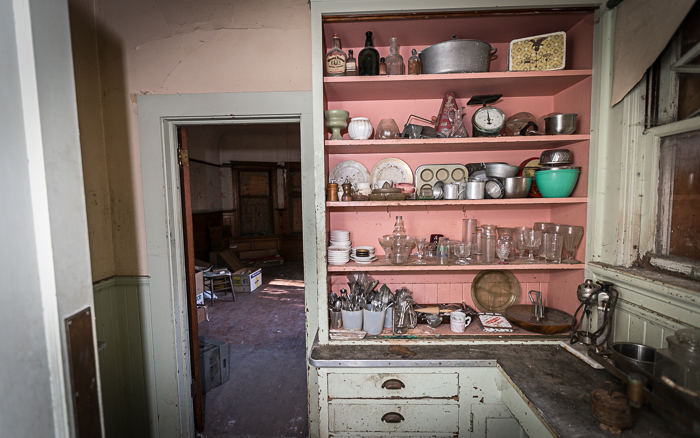 The kitchen remained stocked and furnished, even after years of dereliction and theft by trespassing visitors. This room was the midway along the southern wall on the lower floor. The kitchen and dining nook area. 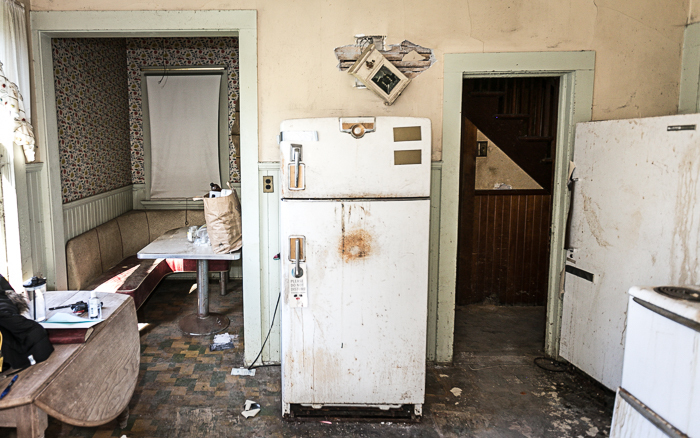 It was in the fridge that city inspectors found what appeared to be a dog carcass when walking through the home following the passing of the derelict property ordinance. This room was the southwestern corner of the lower floor – a secondary stairway is visible through the open doorway. 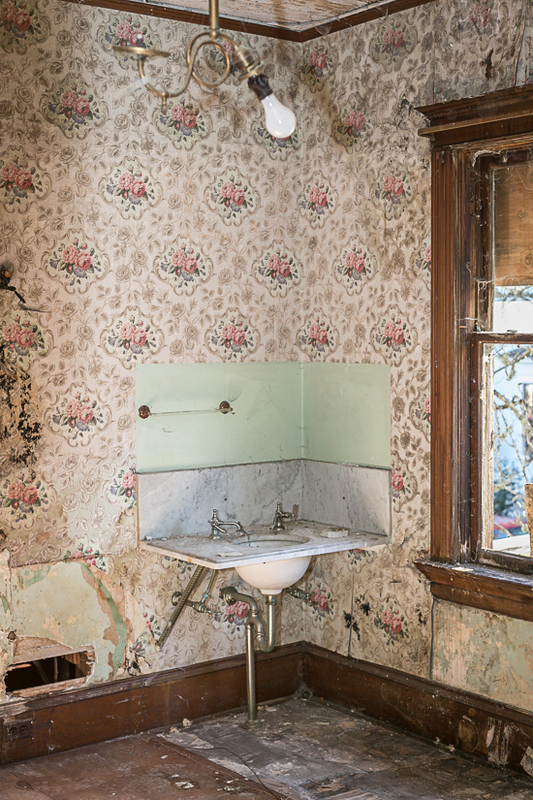 Mold and layers of peeling wallpaper adorn the inside of the home. 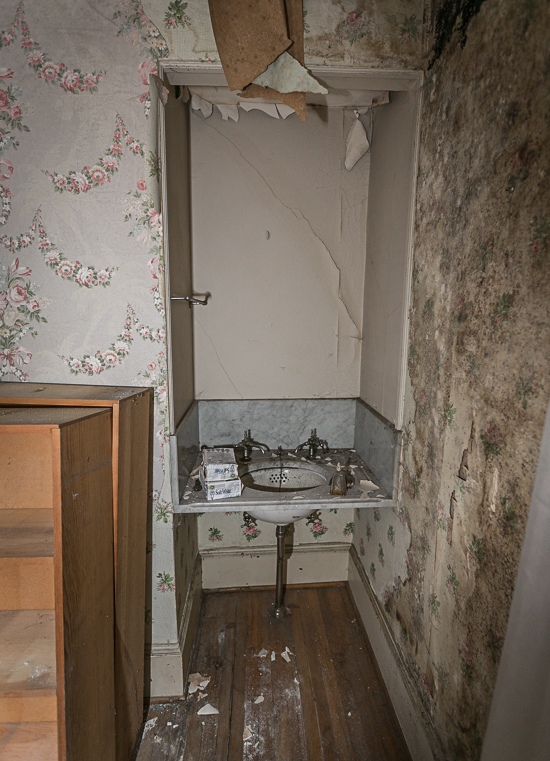 This sink stood in the home’s master bedroom, the southwestern room on the upstairs floor. 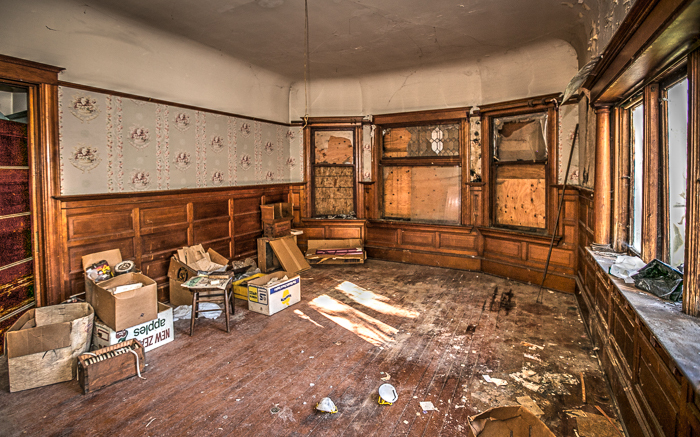 The northwestern room on the main floor, containing much of the junked furniture during the sale, also had the rounded glass window that looked out upon Franklin Street. Though hard to see in this image, the center glass pane in the window behind the curtain had a smooth 90 degree curve that sat flush in the rounded corner of the home. 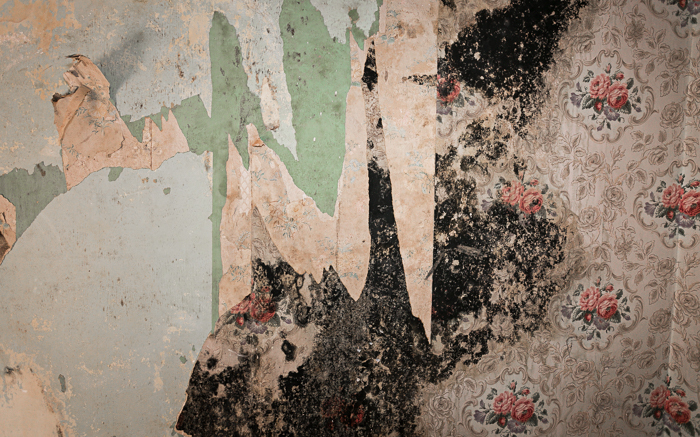 Furniture and moldy and peeling wallpaper from the southeastern upstairs room, a secondary bedroom. The boarded up windows of the southeastern upstairs room. This bedroom, having no windows along its southern wall, was the darkest and had suffered the most mold damage of the upstairs rooms. 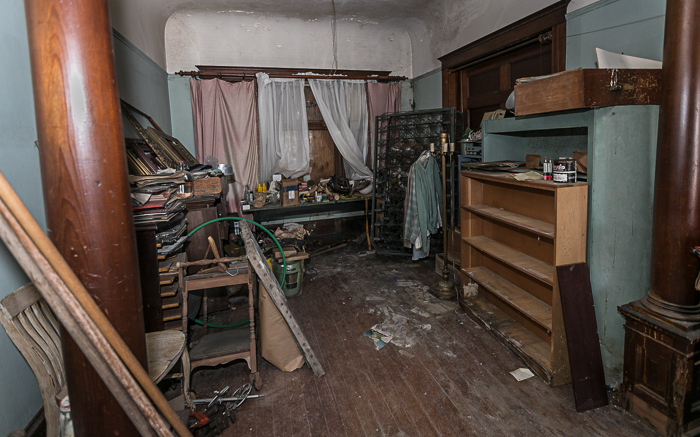 The attic, with papers and detritus piled thick upon the floor, however cleared of furniture that had been there previously, is the room that looks most like the condition of the entire home when I had entered previously. 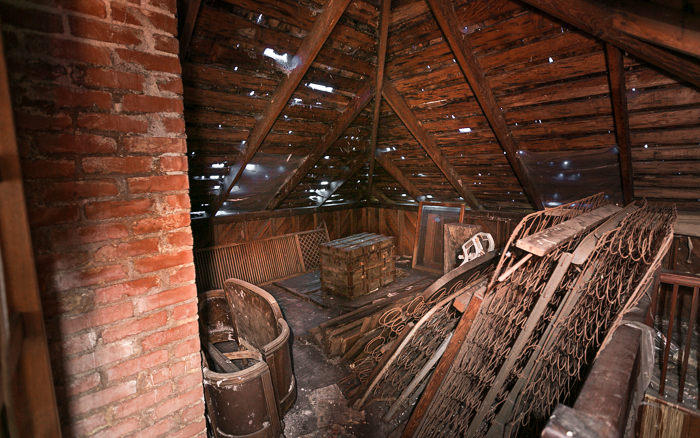 The attic, with holes in the roof that had permitted Astoria’s near-constant rain to permeate the floors below. 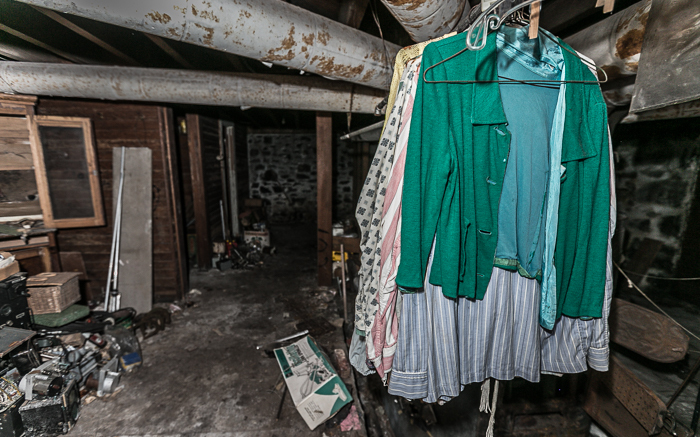 Clothing left hanging in the basement. 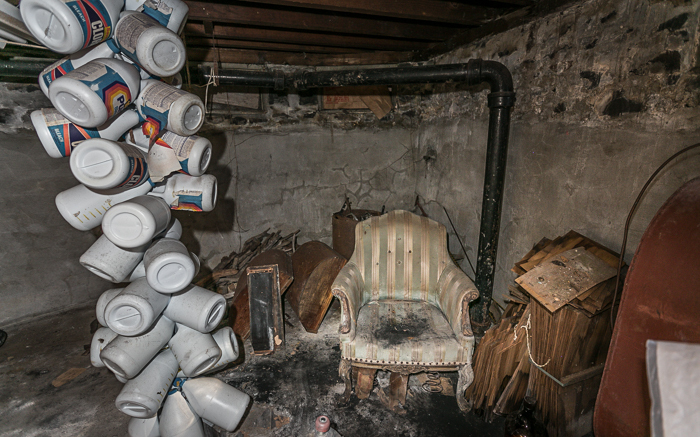 A stringed tower of bleach bottles stands in the basement with no explanation. The northeastern room on the lower level of the house – the main staircase lit by the open front door is visible through the sliding doors. Harry Flavel was known to love books, as reading made up some of the conversation between the reclusive Astorian and others in town that he would come into contact with. Buckling floorboards in one of the home’s bedrooms. This is the northeastern room on the upper floor. After the City of Astoria passed a derelict property ordinance aimed at the home and several other properties left vacant by the Flavels, an estate trust which had been the face of the Flavel family’s business dealings following their departure gave notice that Mary Louise Flavel was choosing to sell the home. This picture is how the home appeared at the time of the sale, where it was ultimately purchased by a local business owner, bringing an end to the storied Flavel ownership of the George Conrad Flavel House. an edited version of this article originally appeared on Morbidology.